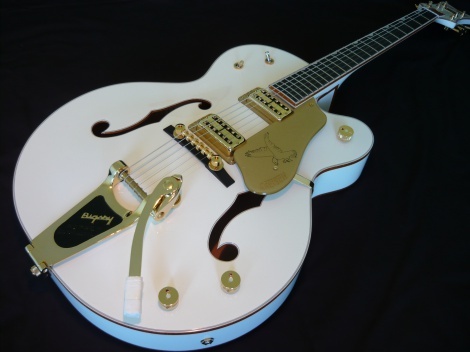 The White Falcon is built using the 1959 trestle bracing, a feature that Chet Atkins had put in his signature model in 1957, to increase sustain and fight feedback allowing the guitar to be played at higher volumes. The G6136T White Falcon™ features classic 1959 styling, with a single-cutaway hollow body, arched top, 1959 trestle bracing, gold-sparkle binding and oversized bound f holes. The three-piece maple neck has an ebony fingerboard with gold-sparkle binding and Neo-Classic™ thumbnail inlays.